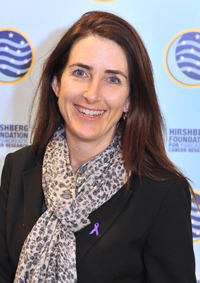 Lisa Manheim is the Executive Director for the Hirshberg Foundation for Pancreatic Cancer Research, a role she has had since 1999. Manheim is a graduate of UCLA where she received her Bachelor of Arts degree in History with a minor in Business. In her role as Executive Director, Manheim has led the strategic development of the Foundation from a small charity to a globally recognized charity. Her leadership roles include overseeing development, communications, marketing and management of the foundation. Manheim is the Event Director for the Foundations’ signature event. Now in its 22nd year, the LA Cancer Challenge has grown into one of the largest 5K/10K’s in Southern California. Since 1998, the LA Cancer Challenge has raised more than $7.5 million for pancreatic cancer research. In 2012, Lisa co-founded the outdoor stationary cycling /spinning event to raise funds to support the battle against cancer. The Inaugural Tour de Pier was held in May 2013 at the iconic Manhattan Beach Pier and each year has surpassed its fundraising goals, reaching the $1M milestone in only its fourth year. Since 2013, Tour de Pier has raised more than $5.6 million for cancer charities. In 2019, Tour de Pier will expand to Seattle, Washington. Lisa continues to lead the way for the foundation to carry on its mission as a non-profit organization advancing pancreatic cancer research.